For over 25 years, Sackett-Waconia as been designing & manufacturing high quality Rotary Blending Systems. The key to success has been simple, tough, designs that are engineered for harsh environments. Rotary blenders by Sackett-Waconia are tough, well built, machines. Our compact drive systems reduce the amount of space needed, and their sturdy construction guarantees a long service life. 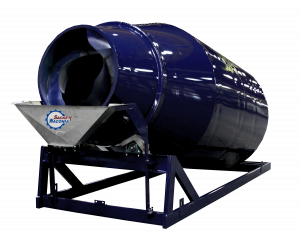 Standard rotary blenders are constructed of 304 stainless steel, feature larger diameter drums for better tumbling, and are built with dished dome heads and continuous welds for high strength. Our compact drive design for 6, 8, and 10 ton models feature short shafts to limit torquing, and have independent belt and chain adjustments. Drive sprockets are bolted to the shell instead of welded, allowing for sprocket changes that can extend the overall life of the unit. 13 & 16 ton models feature direct coupled drives. All units feature crowned trunnions, with Timken bearings, and a precision round 1” thick, fully reinforced, trunnion ring. Discharge rates of up to 6 tons per minute are available. 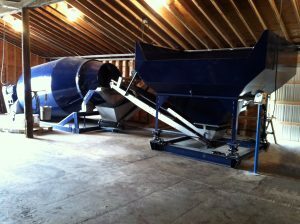 Sackett-Waconia rotary blenders are generally supplied as part of a complete blending system. 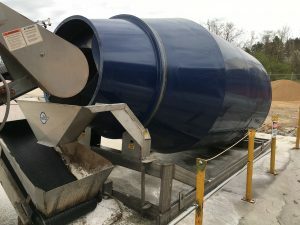 All systems include an NTEP certified weigh hopper, matched to the capacity of the blender, and a loadout conveyor. Optional covers and spouts are available upon request, as are coating an impregnation options. Larger units come standard with a direct drive and internal auger for better mixing, and internal augers can be added as an option for smaller capacity machines.